By participating in the Kaiwi Coast Run & Walk you are supporting local programs within the Hawaii Kai/Maunalua Bay community. Livable Hawaii Kai Hui is a 501(c) 3 non-profit, nonpartisan community organization serving East Honolulu, established in 2004. Their mission is to uphold the integrity of the East Honolulu Sustainable Communities Plan which sets guidelines for sensible development respectful of Hawaiian cultural and natural resources that make East Honolulu a unique place to live. Protection of land through stewardship or acquisition and community education and engagement. Each year Kaiwi Coast Run & Walk donates to Livable Hawaii Kai Hui. In 2015, the donation was designated to go directly to help purchase the Ka Iwi Mauka Lands. Proceeds from the 2016 event will go directly to the Maunalua Signage Project, which will place eight signs in Maunalua with the pahu (drum) image and the place name of site. Over the last six years Maunalua Fishpond Heritage Center has successfully revitalized Kānewai Spring in Kuli`ou`ou. Once nearly stagnant and overgrown, Kānewai Spring is now teeming with native plants and fish. Every day it feeds thousands of gallons of fresh spring water into Kānewai Fishpond, Paikō Lagoon, and ultimately Maunalua Bay. The Kānewai Spring property is currently under contract to MFHC for sale. We’ve been working hard with the Trust for Public Land to raise funds to complete the purchase and permanently protect the Spring with a conservation easement for the community’s health and benefit. More information is available at maunaluafishpond.org. Maunalua.net is a a community organization that is committed to perpetuating the historical and cultural memories of Maunalua. Currently, its entire website is being updated to provide better mapping and additional cultural information. In the past, the Kaiwi Coast Run & Walk has linked our educational section to Maunalua.net. With photos, videos and written information, Maunalua.net is a treasure trove of Hawaiian cultural information about the Maunalua area. All of this takes time and money and the Kaiwi Coast Run & Walk has made a one time donation to help pay to upgrade the entire site. Maunalua.net also leads educational discussions at Pahua Heiau, located at the end of Makahuena Place, from 10-11 a.m. on the last Sunday of each month. Hawai‘i Kai Lions have partnered with the Rescue Tube Foundation to introduce Rescue Tubes to O‘ahu, where there is an average of 27 drownings annually. The 240 rescue tubes already on Kaua‘i have accounted for over 140 rescues. To get the program going on O‘ahu, Lions purchased 100 tubes to give away in the East Honolulu area. 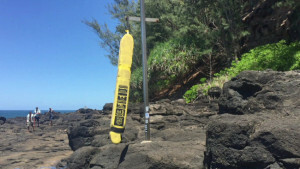 Rescue tube on a Kauai Beach. The Hawaii Kai Lions Club is working to bring rescue tubes to Oahu. A one-time $1000 college scholarship is offered to any Hui Nalu paddler who has paddled from age 12 through high school graduation and awarded annually to all graduates who meet the criteria. Paddling equipment gets used every day and needs full-time attention and care, so equipment budgets at canoe clubs tend to be 40-50% of the entire budget. Having a fundraiser such as the Ka Iwi Coast Run & Walk has meant that Hui Nalu can continue to maintain and repair the sixteen general use canoes while allowing for the purchase of new canoes: a Bradley Lightning and an OC3. The OC3 allows coaches to get everyone in a boat even when they do not have a number divisible by six.